Need a conversation starter at your next social gathering? Become curious around what foods people consider part of traditional holiday celebrations, and how they prepare those foods. You might be surprised. In preparation for our PEN® Holiday Season Countdown, I was fascinated to learn about the different ways around the world that we ate the same foods. For example, in parts of Canada, pumpkin is considered a traditional holiday-season food. We often add pumpkin to our pancakes, breakfast smoothies, pies, cookies and lattes – i.e. sweet uses of pumpkin. However, in the UK and Australia, and in Caribbean and West Indian populations in Canada, pumpkin is more typically used as a savoury food, either roasted as a side vegetable or as part of a rocket leaf and feta salad. There were other differences in the kinds of foods some associated with the holiday season – eggnog, mulled wine, marzipan and what foods were left out for Santa and his reindeer. What was fascinating to me was the passion that we all held for our own traditions, and the surprise when we learned that foods that had no meaning to us had significant meaning to others. Whether it is the holiday season, a special cultural celebration, a birthday or just everyday eating, there are diversities in what foods we each consider part of our routine way of eating. Becoming curious about how foods are used differently allows people to share their own wisdom, stories, personal meanings and connections – something that often brings a smile to people’s faces. I am also reminded about how lucky we are as a dietetic profession to work with food as the “tool of our trade”. Whether it is in primary care, policy work, research, marketing, communications or community-based programming or individual counselling, we each have the opportunity to be curious about foods considered traditional, how those foods are enjoyed, and how our nutritional guidance needs to be tailored to culture-specific uses of foods. In this issue of PEN® eNews 4(4) we are celebrating the end of another year. We share our annual PEN® Team’s surprising findings of 2014. Taking pseudoscience to task! outlines details behind Sense about Science’s Ask for Evidence campaign. Rapid critical appraisal – Digesting evidence fast! Part II shares our experiences of using rapid critical appraisal to examine research articles with dietitians. How I tackled updating the colorectal cancer PEN® knowledge pathway shares a behind the scenes look at updating our colorectal cancer PEN® knowledge pathway. All this and more in eNews 4(4). On behalf of the PEN® Global Team, we wish you all a very Happy New Year! What method of weight loss (energy restriction and/or exercise) is most effective to achieve weight loss and maintain lean body mass in overweight/obese older men and postmenopausal women (≥50 years old)? What is the effectiveness of krill oil compared to fish oil on cardiovascular risk factors in healthy adults and in adults with dyslipidemia? Are there safety concerns for regular tea consumption in adults, including pregnant women, related to metal contamination? What is the recommended process for introducing new complementary foods to infants (i.e. how many new foods introduced at one time, how long to wait between introducing new foods)? Is telephone nutrition counselling delivered by dietitians effective for improving health behaviour and clinical outcomes in healthy adults and adults with chronic disease? Which predictive equation is the most accurate for assessing resting energy expenditure (REE) (also referred to as resting metabolic rate [RMR]) in normal weight and overweight/obese adults? What is the best predictive equation for assessing estimated energy requirement (EER) or total energy expenditure (TEE) in overweight and obese adults? What treatment strategies are recommended for iron-deficiency anemia in adults with inflammatory bowel disease (IBD)? New handout collections are now live on PEN®! 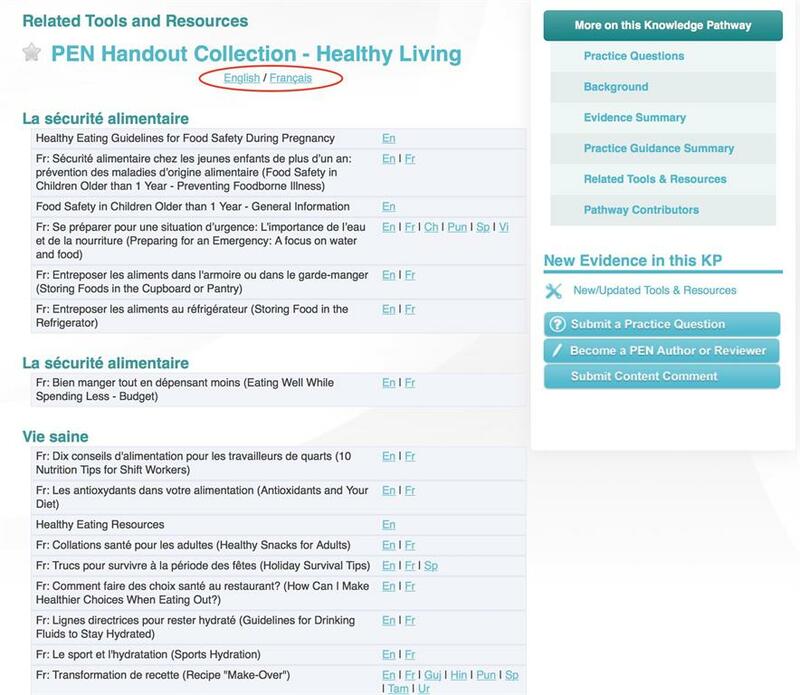 We are excited to announce that the new redesigned handout collections are now accessible in the PEN® knowledge database! PEN® handouts are amongst the most highly accessed pieces of information in PEN®. The PEN® handout collections have been redesigned to make it easier to access PEN® client handouts and to make the language translations and culturally-adapted handouts even easier to find. Within each collection, you’ll be able to see at a glance which handouts have been translated or culturally adapted. A simple click of the mouse allows you to view print or send the handout to your client. Looking for French handouts? The French handouts are no longer available in a designated French language handout collection. 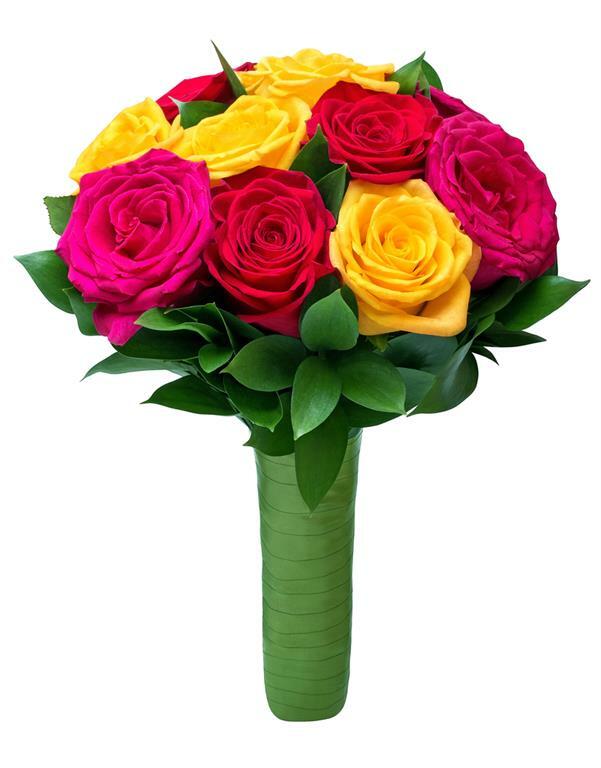 However, they have been amalgamated into all the different collections with the other languages. 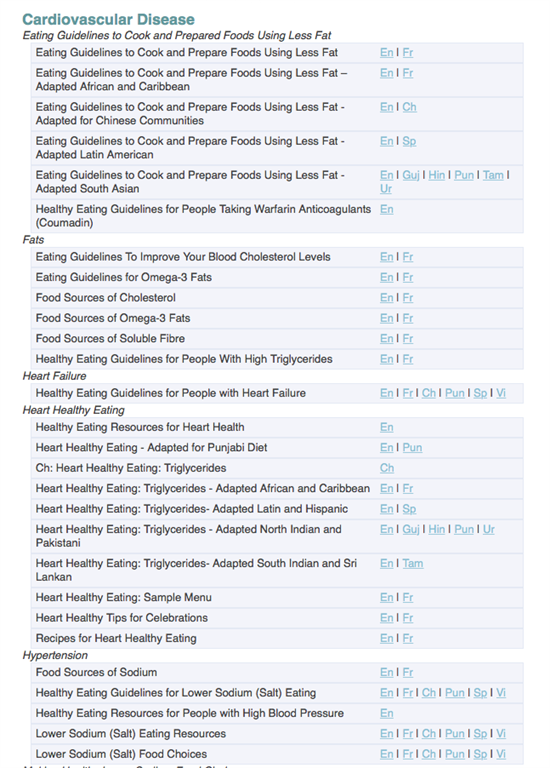 We did this to make it easier for dietitians to locate the handout they need, in the language and cultural adaptation needed. We have also added a feature to make it easier for French speaking dietitians to see which handouts are available in French. In addition to having Fr listed next to handouts that have a French version available, there is also an English/French link at the top of each handout collection that will allow you to toggle/switch between English and French titles. All handouts that have a French version available will have their titles show up in French. Handouts that are not available in French will have their titles remain in English. If you have any questions or concerns, feel free to contact me at lisa.koo@dietitians.ca. The PEN: Practice-based Evidence in Nutrition® Global team would like to congratulate the Sense about Science Organization for their leadership with their campaign Ask for Evidence. Sense about Science is a UK-based charity that “helps people to make sense of science and evidence and promote use of evidence in public life”(1). In 2011, Sense about Science launched the Ask for Evidence campaign. This campaign aims to empower the public to seek out the evidence behind the headlines or claims - “to applaud the good use of evidence and hold those misusing evidence to account” (1). Stories about people requesting evidence for cancer cures, migraine treatments, recycling claims (What actually happens to the waste you send for recycling? ), and more. Resources from credible, evidence-based organizations including the British Dietetic Association. And you can also pose your questions directly or share your experiences with asking organizations or individuals to provide the evidence behind their claim. Dietitians will be especially interested in what governments had to say about the evidence underpinning fruit and vegetable consumption recommendations around the world! Other thought leaders have noted the issue of pseudoscience recently. Dr. Caulfield, a Canadian lawyer, wrote about the paradoxes of pop science where he challenged those using scientific language in very unscientific ways to sell products. Dr. Tanis Fenton wrote an article about how she responded to misleading nutrition information in a lay publication. Pharmacists (another self-regulated health profession) are debating the ethics of selling products such as natural health products or homeopathic preparations that lack evidence of efficacy. A lot of public money and human resources are spent on creating valid, reproducible evidence that can and should have positive impacts on health. But the impact can be lost in the “noise” created by the vast amounts of questionable headlines or marketing messages masquerading as science. The public is overwhelmed by the latest health breakthrough in the news or found on product labels and is becoming cynical about the value of any health recommendation given the amount of contradictory information making headlines (2). The Ask for Evidence campaign has produced a guide to asking for evidence that outlines a simple, respectful approach to requesting the scientific evidence behind any kind of claim, advertisement, policy statement or newspaper story. We applaud the many health professionals and consumers who call those making “suspicious” or fraudulent claims to task. If enough people took the time to actually ask for evidence, it could make quite a difference in the amount of junk or pseudo science making headlines and make “more room” in our crowded attention spans for the important breakthroughs that deserve our attention and action. Bravo Sense about Science and the Ask for Evidence campaign. Recently, my searching, evaluating and writing ability were all put to the test while updating the PEN® content on colorectal cancer, including five practice questions, 11 key practice points with the associated rationale and references and the evidence summary. A huge number of studies from across the world contribute to a vast evidence base on this topic. Research ranges from the large prospective studies, such as the European Prospective Investigation into Cancer and nutrition (EPIC), to the Nurses’ Health Study and the Shanghai Men’s Health Study, two much smaller lab-based research about the mechanisms behind the development of cancer. While searching, evaluating and writing, I used the PEN® Writer’s Training Modules. These modules are well worth checking out as they go through the evidence based practice cycle reminding you to Access, Ask, Acquire, Appraise and Apply and going into some detail about how to do this. The PEN® evidence grading checklist was also invaluable in enabling me to categorise which studies produced the most important results. This checklist provided a framework that I used to guide my critical appraisal of each paper and also a way of assessing how good the overall evidence for each practice point was. The World Cancer Research Fund Continuous Update Project (CUP) published updated evidence for colorectal cancer in 2011. This 43 page document was a review of systematic literature reviews by a panel of scientists, it provided a valuable starting point to updating the PEN content, but many of the systematic reviews published since 2011 included studies that were considered by the CUP so it was important not be biased by including the same study results twice as this would be considered double referencing, which skews the perception of the strength of the research findings. Despite the huge amount of new research, many of the practice points remain the same. It has been interesting to observe how results from a newly published study can be reported in the press, especially if those results seem to be new or different. However a single study can never change practice. Results must be evaluated in terms of quality and be reproduced, adding to the evidence base. While this is unfortunately a rather slow process, it is reassuring in that it perhaps takes longer for practice to become out-dated than media stories would suggest. 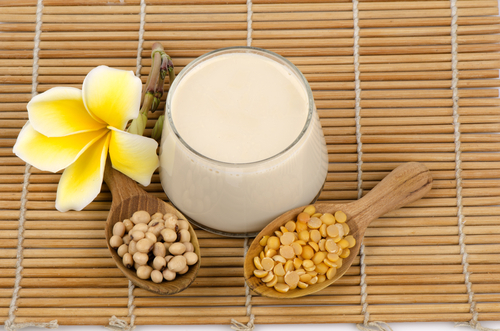 Ensure a good intake of foods containing dietary fibre. There was not enough evidence to comment on how the source of dietary fibre impacts the development of colorectal cancer. Although initially somewhat overwhelming, on reflection it has been a great opportunity to dive into a subject and really get to grips with the current literature in this area. Six new resources have been added to those already listed, including resources from the UK, Ireland and Australia, helping to showcase the best of the best resources around the world, and making the PEN® knowledge database truly international. Watch for the Colorectal Cancer Knowledge Pathway to be updated in 2015. Text box: Do you need to update or refresh your skills in writing and searching? 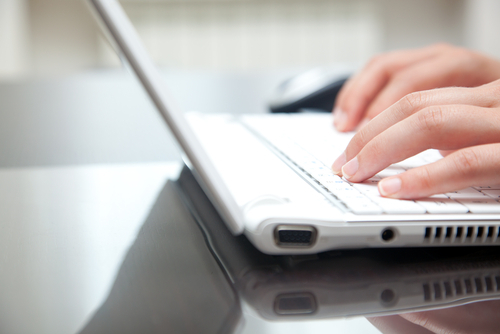 Have a look at the PEN® Writer’s Training Modules. Each day, our Global PEN® team monitors the literature for evolving research and monitors for nutrition trends. What surprised us? As we approach the end of 2014, our PEN® global team has reflected and noted their 13 surprising findings from this past year. I ran head long into this “controversy” when assisting a dietitian with a review of some clinical practice guidelines, which, among other things, sought to recommend optimal sodium levels for patients with chronic kidney disease. A systematic review of observational studies published this year suggested that there may be increased risk of mortality associated with both high and low sodium intakes (1). I can’t say I am on the fence on this one - I still firmly believe that the evidence points to high sodium intakes (above 2300 mg/day) being associated with higher risk for cardiovascular disease. The IOM Committee, in their 2013 “assessment of the evidence” also concluded that there could be substantial population benefit and little risk of harm from reducing excessive intakes of sodium to the 2300 mg/day level (2). However, in light of new evidence, they also cautioned about recommending 1500 mg/d as a desirable sodium target for the general population. I’d like to see more dialogue as well as more and better research around the lower end of sodium intakes. Is the association between low sodium intakes (<2300 mg/d) and increases in all cause mortality a real effect? Or are patients who consume very low amounts of sodium frailer, sicker and is it the frailty, lower total food intake, or co-morbidities that account for the observed increase in all cause mortality, rather than the low sodium intake? 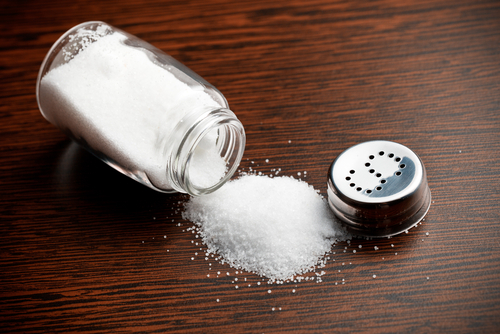 The IOM goes further and suggests there needs to be improvements in how we measure sodium intakes in populations, as well as consideration of the intakes of other electrolytes (notably potassium). While we likely don’t know the optimal sodium intake for the general population or subgroups, once again, moderation appears to be our best option until more research is conducted. Plant-based beverages seem to be taking over more and more of the “dairy” case in supermarkets these days. This space take over likely reflects increasing sales of these beverages. A finding that surprised me this year was learning that there have been several case reports of severe malnutrition among infants and toddlers who have been fed these beverages as part of a regular diet. One of these infants, a 2.5-month-old, who was fed almond, nut, and soy beverages for 1.5 months actually died. A further surprise is the low nutrient levels in Rice Dream®, especially in the Original Unenriched version, which is made from rice. Based on product label comparisons at my local grocery store, the protein level of this product is 0.4 grams per cup, compared to 8 g for cow’s milk. PEN® surprising finding: Paleo diet benefits? I was surprised by the lack of consistency of the benefits from eating the Paleo diet. There have been three randomized trials of the Paleo diet, and the findings in each study were not replicated in the others with the exception of only a few things (1-3). The Paleo diet consistently reduced serum triglycerides (2,3), compared to a diet for diabetics (evenly distributed meals, increased intake of vegetables, root vegetables, dietary fiber, whole-grain products, fruits and berries, and decreased intake of total fat with more unsaturated fat, while incorporating concepts of glycemic index and varied meals through meal planning by the Plate Model) and a low fat high fibre diet (daily intake of 15% of energy intake from protein, 25–30% from fat and 55–60% carbohydrates, with emphasis on low- fat dairy products and high-fibre products). However, triglycerides can be reduced when obese people follow high protein diets that include grains and dairy as was seen in another randomized trial (4). The outcomes of LDL cholesterol, systolic blood pressure, or fasting insulin were not improved on the Paleo diet relative to the comparison diets (1-3). The Paleo diet is promoted mostly for weight loss but proponents also claim that for maximum health, we should eat what humans ate during our early evolution. In short-term studies, compared to a Mediterranean-like diet, there was no significant differences in weight loss at six and 12 weeks among obese men with ischemic heart disease randomized to the two diets (1). Compared to a diet for diabetics, the researchers reported a significantly greater weight loss of three kilograms after three months on the Paleo diet (2). In a longer term randomized study, obese participants following the the Paleo diet, compared to a diet based on the Nordic Nutrition Recommendations (high fibre, low fat), had a higher weight loss at six months; however, there was no significant difference in weight loss between the groups at two years (3). I also learned that little is known about what actual foods were eaten by ancient peoples, what they ate varied by their location, and there is evidence that some ate grains and legumes. Further, humans have evolved since the advent of agriculture, as some populations have evolved to digest lactose. Thus, the premises of the Paleo diet are actually in error. For more information, login to PEN to see our Popular Paleo Diet Evidence Clip. The HungerCount results for 2014 (1) show that not only is food bank use increasing (+24.5% change since the Canadian economic recession in 2008), but what I found most surprising in the data this year is that 62% of food insecure households earn the majority of their income from employment. Food insecurity affects many people but I hadn't realized how many are actually employed. These HungerCount statistics, which are a national (Canada) survey of emergency food programs in Canada, support the need for a living wage so people can live in dignity. From Katharine Schmidt, Executive Director of Food Banks Canada, "the unfortunate combination of low-paying jobs, inadequate supports for the unemployed, and a lack of training opportunities for Canadians is keeping food bank use near record levels." (1). So essential community supports, food banks and the community programs they support, need to continue until the root causes of hunger are addressed for lasting change. Looking globally, the State of Food Insecurity in the World 2014 report indicates that about 805 million people are undernourished with 63 developing countries reaching the hunger target of the Millennium Development Goal #1 (of halving the proportion of undernourished people in developing countries by 2015) (2). However while global hunger reduction declines, severe food insecurity exists, especially in areas affected by conflict and natural disasters such as sub-Saharan Africa and Western Asia. What is the role of immunonutrition in critically ill patients? Studies have shown inconsistent effects of supplemental immune-enhancing nutrients (e.g. arginine, glutamine) on infectious complications in critically ill adults. [See related questions in the Critical Illness Knowledge Pathway]. However, I have been surprised about emerging studies showing greater risks associated with immunonutrition in critical illness. Notably, the MetaPlus study examined the effect of high protein enteral nutrition supplemented with immune-modulating nutrients (fish oil, antioxidant nutrients (vitamin C, E and selenium) and glutamine) compared with a standard high protein enteral nutrition in about 300 mechanically ventilated critically ill adults (1). No differences in rates of infection were observed between groups, but alarmingly there was a suggestion that immunonutrition was associated with greater mortality. 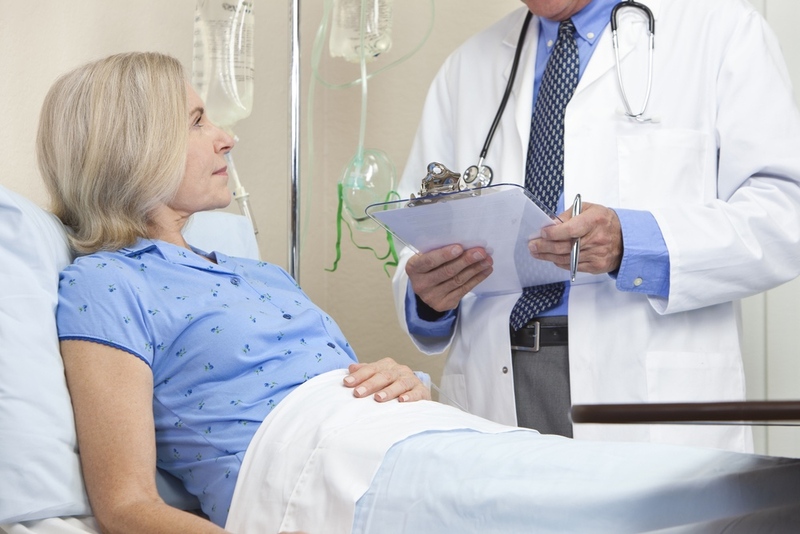 This study augments other recent multicentre trials using higher doses of various immune-modulating nutrients, which show that ‘less may be better’ in critical illness. I have been surprised this year at the controversy surrounding nutrition recommendations that have limited supporting evidence (although I probably shouldn’t be!). I have observed with interest the recommendations from people outside of the nutrition and dietetics profession for the ‘Paleo Way’ of eating, low carb and high fat diets, and the claim that saturated fat has no impact on cholesterol levels. It certainly has been a challenging year for evidence in nutrition. This has really reminded me how powerful anecdotal evidence is, particularly from someone/a group who is recognized by the public as a trustworthy source of information. Although these issues have placed a great deal of pressure on our profession, I think it has been a great reminder of how careful we need to be as dietitians to make sure that we analyze evidence critically and communicate it in a clear and helpful way to members of the public. Of course, this is not easy. Dietitians can be confident in the high quality evidence PEN® provides to strengthen an argument. As the profile of PEN grows hopefully dietitians will be able to use this in our favour to convince the ever curious public that we are the experts in food and nutrition and hold their health in our best interest. Exciting times ahead! My surprising finding is actually my own observation (albeit one that I expect is shared by others) that the increasing emphasis on evidence-based practice seems to be in parallel with the emphasis on misrepresented "scientific" findings. Evidence-based practice is clearly supported across many disciplines and organizations on all levels. Yet, there also seems to be an increasing number of headlines and dialogue about nutrition-related findings that are a result of limited and/or misinterpreted evidence. In the past year, there has certainly been stellar evidence, including systematic reviews of well-designed randomized control trials, which has changed and/or reaffirmed practice. However, there has also been attention given to evidence from poorly designed research and/or analysis; including inappropriately extrapolating results from one population to another and making strong statements based on few numbers. In addition, the misuse of observational data continues to be a frequent culprit in the misinterpretation of evidence. Observational studies can certainly provide rich and important data, but the evidence can never be assumed to be cause and effect. One of the PEN® knowledge database's greatest strengths is that it is Internet-based and thus is accessible to many people around the world. However, our expanding PEN® Global Team must always compete with the accessibility of nutrition-related evidence that is not credible, but receives widespread attention. Thankfully, we have many dietitians, health providers and researchers who join us in this battle. As Shakespeare noted: the “truth will out!" A surprising finding from 2014? I find little surprises me nowadays in the field of nutrition research. However, I can say that something that has certainly caught my interest this past year is research emerging on the role the gut microbiome may have in eliciting seemingly paradoxical effects. For example, the 2014 study that reported finding artificial sweeteners (mostly saccharin was studied) to alter the gut microbiome in mice and in a very small sample of humans, and to also negatively affect glucose tolerance received much press (1). Click here to read our article analysis. For artificial sweeteners to impact glycemic responses is generally unexpected due to the non-caloric nature of artificial sweeteners. However, what is particularly fascinating to me about this research is the potential causal connection of the impaired glycemic response with changes in the microbiome; as observed from not seeing an impact on glucose tolerance when the mice had their gut microbiome eliminated with antibiotics and the elicitation of glucose intolerance when feces were transplanted from saccharin-fed mice to mice with sterile intestinal tracts. Additionally, last year there were some interesting articles published on gut microbiota metabolism of L-carnitine to trimethylamine-N-oxide (TMAO) and its relationship to atherosclerosis and cardiovascular risk (2,3); while at the same time supplementation with L-carnitine for secondary prevention of cardiovascular disease has been studied (4). So, do these compounds help? Harm? Have no effect? 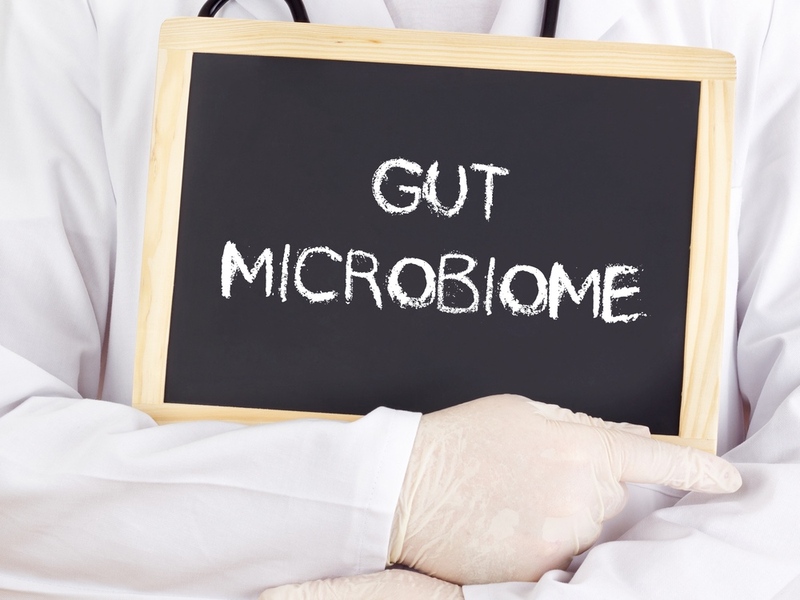 Are their effects ameliorated by the gut microbiome? Do some humans respond differently to these compounds? And, in the case of L-carnitine, are the effects different if from food or supplement? So much left to investigate…. My surprising finding this year was the depth of the controversy surrounding vitamin D recommendations, and the heated debate and passionately held views of a number of researchers, authoritative sources and organizations. Central to this controversy, there is no agreement regarding what is the optimal plasma concentration of vitamin D. Therefore, there is disagreement among experts as to whether populations are deficient in vitamin D or not and what the recommendations for intake should be. It is also still not understood if vitamin D is a precursor to disease or just a marker of ill health. Furthermore, the research about the health benefits of vitamin D and its relationship to various diseases is inconsistent. At last count there were six systematic reviews released in 2014 (and many before then), which have different conclusions; adding to, rather than resolving the confusion. For a more complete discussion of the issues and the bottom line for dietitians, watch for PEN®’s upcoming Evidence Clip: Vitamin D-lemmas. This vitamin, like so many before it, may not turn out to be the darling of the supplement world. As an avid cheese connoisseur, I was really surprised by the relationship between per capital consumption of cheese in the U.S. and the number of people who died by becoming tangled in their bed sheets! I learned of this correlation in an article published in PEN eNews. I had never thought of spurious correlations in these terms and it helps to encourage people to consider the many other confounding factors that may influence the relationship between two variables. During my short time as a PEN® Evidence Analyst I have been surprised to learn that an estimated 20% of cancers are thought to be caused by obesity (1). I knew from my research with breast cancer survivors that obesity is particularly linked with postmenopausal breast cancer, but I was surprised to find that colorectal, oesophageal, gastric, pancreatic, endometrial, gall bladder, and prostate cancer are all associated with obesity (2). Abdominal fatness and its link with circulating oestrodiol levels drives the increased risk for endometrial and breast cancer. Insulin levels seem to link obesity and colorectal cancer and low grade inflammation links obesity with pancreatic and other GI cancer (2). The mechanism by which obesity influences the development of oesophageal cancer is still to be elucidated (3). My surprise finding as I navigated the literature on gastroestophageal reflux disease (GERD) was the ‘old’ research and lack of evidence to support recommendations for lifestyle management of GERD symptoms. Clinical guidelines start with lifestyle management before moving on to drug and then surgical treatments. The American College of Gastroenterology guidelines, for example, still rely on older studies for weight loss management (1996, 1999, 2006); head of bed elevation (1996,1997); avoidance of late meals (1989,1998); cessation of tobacco and alcohol (1987, 1989, 1995); and avoidance of trigger foods (no evidence) (1). Studies investigating chocolate as a trigger food, for example, (1975,1988) showed that the lower esophageal sphincter relaxed (and therefore might cause symptoms) after healthy subjects had a chocolate drink and, but there were no studies that looked at whether symptoms were improved significantly after stopping chocolate (2). Recommendations for lifestyle management are based on expert opinion rather than evidence. The best evidence for lifestyle change to improve GERD symptoms is for obesity. The dietitian’s role in GERD treatment is to contribute to weight loss management and to help individuals decide whether individual-specific trigger foods should be avoided in the context of maintaining good nutritional intake, rather than global elimination of ‘trigger foods’. Dietitians could also contribute to new research that updates evidence on lifestyle recommendations. In working with a dietetic student on developing upcoming content for the PEN® knowledge database I was surprised to learn there has been some clarity in our understanding how the age of introducing gluten-containing foods to an infant can affect their risk of developing celiac disease (CD). The clarity is based on two new RCT’s. Based on previous research a number of countries have developed guidelines suggesting that gluten-containing foods should be introduced between four and six months, i.e. not before four months or not after seven months. To date, these guidelines have been controversial. Two recent studies (1,2) come to the same conclusion that the timing of when an infant starts to consume gluten has only a minor role in the development of celiac disease. Based on these results, it is difficult to continue to recommend introduction of gluten between four to six months and while there are many health benefits of breastfeeding, it probably won’t prevent the development of CD. Future research needs to look at other ways to prevent celiac disease. One of the studies included 553 infants, with a first-degree relative who had celiac disease, assigned to receive gluten-containing foods at either six months (Group A) or 12 months (Group B) (1). Those with a standard-risk HLA genotype or a high risk HLA genotype, as determined at 15 months, were included in the study. They were assessed for CD autoimmunity (tissue transglutaminase (tTG) autoantibody) at 15, 24 and 36 months and at five, eight and 10 years. They found that development of CD may be delayed but not prevented by the introduction of gluten. If they had a positive serum result they underwent an intestinal biopsy to confirm CD. At 24 months Group A had a much higher incidence of CD (12% versus 5%) but once they reached five years of age it was no longer statistically significant (both groups had 16%). By 10 years of age those with a high-risk genotype were more likely to have CD than those with a low risk genotype. Breastfeeding, duration or if the infant was still breastfeeding when gluten was introduced, had no effect on the risk of developing CD. Those in Group B who developed CD did so later than those who developed CD in Group A, allowing them a longer period of health during critical development years. The other study included 944 infants who had a first-degree relative with CD and a high risk genotype (HLA-DQ2 or HLA-DQ8) (2). Subjects were randomly assigned to either receive 100mg of gluten/day (n=475 or a placebo (n=496) from the ages of four months to six months. CD autoimmunity (tissue transglutaminase (tTG) autoantibody) was checked from time-to-time and all were followed up until at least three years of age. The cumulative incidence of CD at three years was 5.2%) but there was no difference in incidence between the two groups. Breastfeeding, duration or exclusive or not, had no affect on the risk of developing CD. This study continues to follow up the subjects to see long-term outcomes. Individually and collectively, these campaigns and resources seek to delve deeper to understand the congruency between claims and what the science has actually shown. We look forward to seeing what 2015 will show. Overwhelmed with too much literature? Trying to make sense of the latest study being promoted in the media? Looking for an answer to your practice question? These were the questions that we posed to participants interested in our recent Speed Sharing/Speed Networking session on Rapid Critical Appraisal held at the 2014 Dietitians of Canada National Conference in Ottawa. Our goal was to work through a rapid critical appraisal checklist as a way to help determine whether a study addresses an individual’s practice question and to quickly examine the study’s quality, validity and relevance. In our last issue of PEN eNews, we described what Rapid Critical Appraisal is and how to conduct it. In this issue, we describe our experience from that Speed Sharing session. At over 20 different Speed Sharing tables, participants were able to sit down for 15 minutes at a time, for discussions with hosts from various DC networks and nutrition and dietetics action or special interest groups. This was the first year that this event was held at the Dietitians of Canada conference. In our short sessions we discussed what rapid critical appraisal is and how to do it. We went through a 4-step Rapid Critical Appraisal checklist. We also wanted to provide our participants with an opportunity to go through the checklist themselves, with an actual published study in hand, to apply their skills. Our short time limit restricted us to just examine study abstracts for this exercise. We provided participants with six very different article abstracts to choose from, with topics ranging from cardiovascular disease, type 2 diabetes, gout, kidney stones, breastfeeding and caffeine. Each group that attended our sessions selected the same article on caffeinated energy shots (1). Clearly caffeinated energy shots are a hot topic and definitely something we plan to keep our eye on! After carefully reading the abstracts, our participants were able to quickly and accurately identify the PICO, the study design and whether it was the most appropriate design for the research question. They identified notable study limitations that were obvious just from the abstract and generated questions of details they wanted to look for in the methods sections of the full article to further evaluate the study validity and relevance. If we had to pick one thing that we wanted participants to remember most from our session, it would be this: keep the PICO framework in mind when reading both abstracts or full articles. 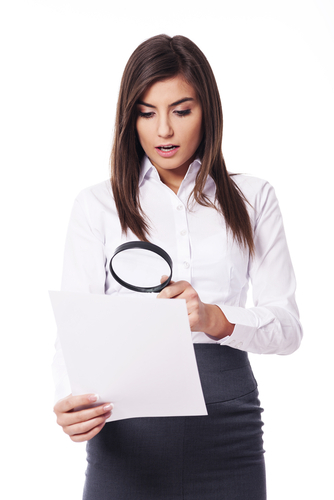 Within the four categories of PICO, many of the key elements and limitations to look for in an initial appraisal of an article will quickly become apparent. With PICO in mind you can also very quickly filter many studies out of your literature search saving you precious time as you research a topic. How do I…find alerts and recalls in PEN?